The Hejnar G013-60 is a long waited shorter sibling of the Hejnar G013-80. Which G013-80 is well known from its introduction as a horizontal rail in the second version of my Multi Row Panorama Head Ver. II. 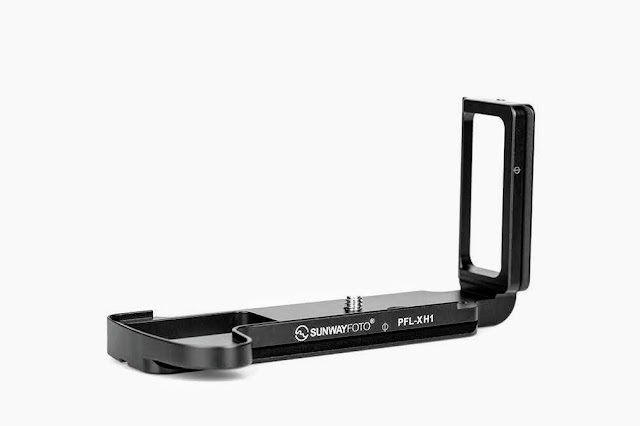 This 6" long by 1/2" thick Arca-Swiss® compatible multipurpose rail among other uses is a good candidate for a shorter Long Lens Support Bracket (shorter-long is quite oxymoron but true) as described by Hejnar Photo. On the other hand, I feel it's a great replacement of the G015-60 as horizontal rail in a mini milti-row panorama head as we can see further down. 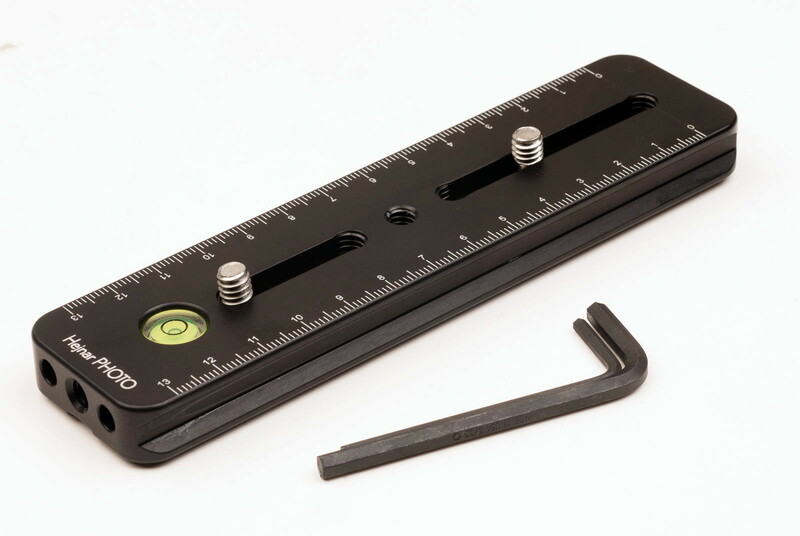 The Hejnar G013-60 has two captive slots, a center 1/4"-20 tapped hole and is accompanied by two 1/4"-20 hex socket captive screws and two Allen hex keys one 4mm for the 1/4"-20 screws and one 2.5mm for the M3 safety stop screws. 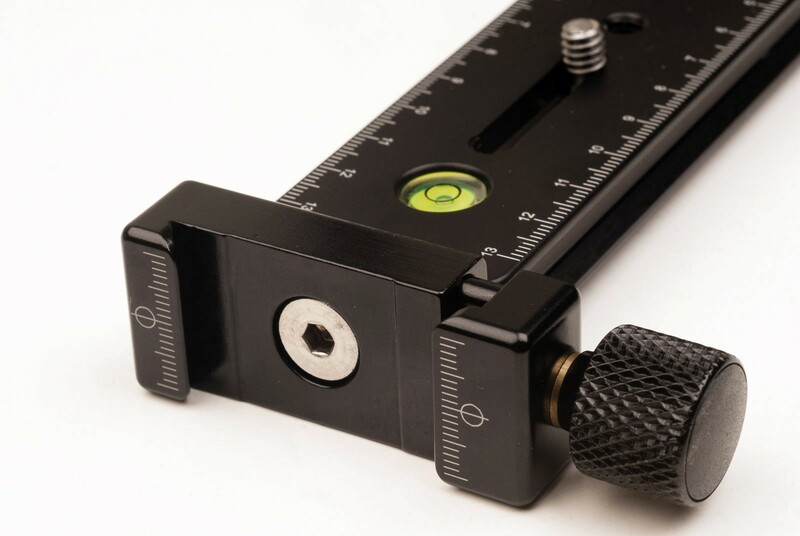 Much like on all Hejnar 1/2" thickj rails, laser engraved decimal scales run on both top edges marked in 1 mm increments , which according to the Hejnar pattern start from the edge (point 0) of the back slot and finish at 13 cm all the way to the front. Hejnar Photo G013-60 Multi Purpose Rail with screws and Allen hex keys top side view. Looking under the rail, we can see the usual in short rails centrally located brace holding the pass through 1/4"-20 hole. There are also two M3 safety stop screws at both ends, which may prove useful from protecting the rail slipping off. Hejnar Photo G013-60 MPR bottom view with safety and mounting screws in place. As with the G013-80 the difference between the other Hejnar Multipurpose rails of this thickness and the G013-60, lies on the two extra 5 mm dowel pin holes on the front (aside the 1/4"-20 tapped hole) and on the sizable extra bubble level. Hejnar Photo G013-60 MPR front tapped hole and dowel pin holes detail. Using one dowel pin as shown previously, then the Hejnar PHOTO F60 1" Quick Release Clamp (Review) can be aligned and fixed securely on the front tapped hole of the rail via one 1/4"-20 flat head screw which is provided with the F60 clamp and the 4mm Allen hex key appropriate for 1/4"-20 hex socket screws (also provided). 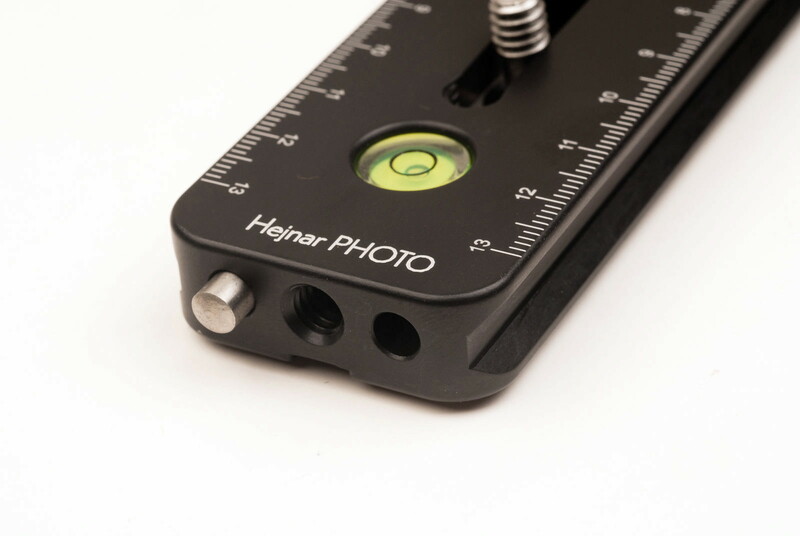 Hejnar Photo G013-60 MPR with F60 1" QR clamp mounted on the front hole. 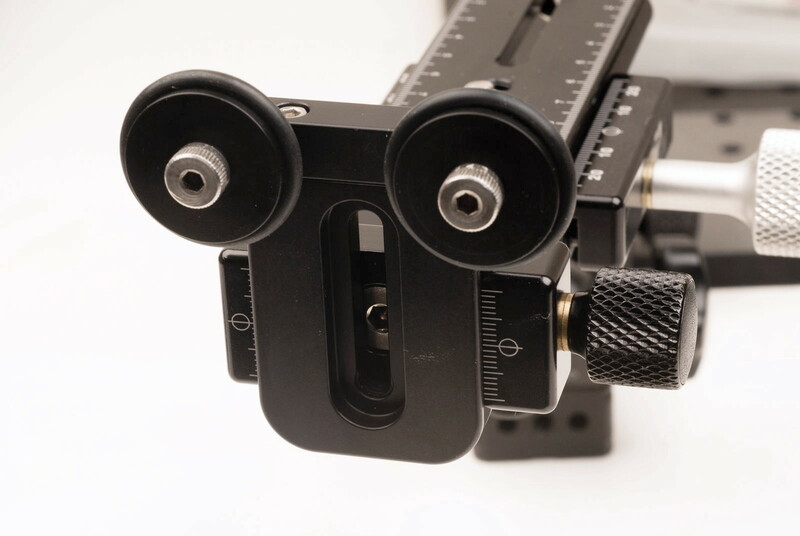 The picture below demonstrates the use of the standard Hejnar PHOTO Modular Lens Support Bracket MOD-1 (Review) attached on the front of a Hejnar Photo G13-60 rail by means of an F60 1" quick release clamp, as height regulator. 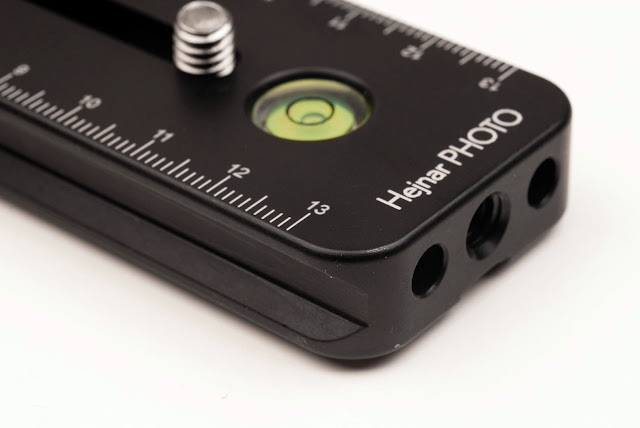 Hejnar Photo G013-60 Multi purpose Rail with F60 1" QR clamp attached and MOD-01 Modular LLSB . The Hejnar G013-60 1/2" thick rail may be a lighter substitute of the Hejnar G015-60 5/8" thick rail originally suggested for a horizontal rail in the structure of the Multi-Row Panorama head as described in detail in Create a Mini Multi-Row Panorama Head for Mirrorless Cameras article. Replacement of the G015-60 with the G013-60 will result in saving 65 gr of total weight. 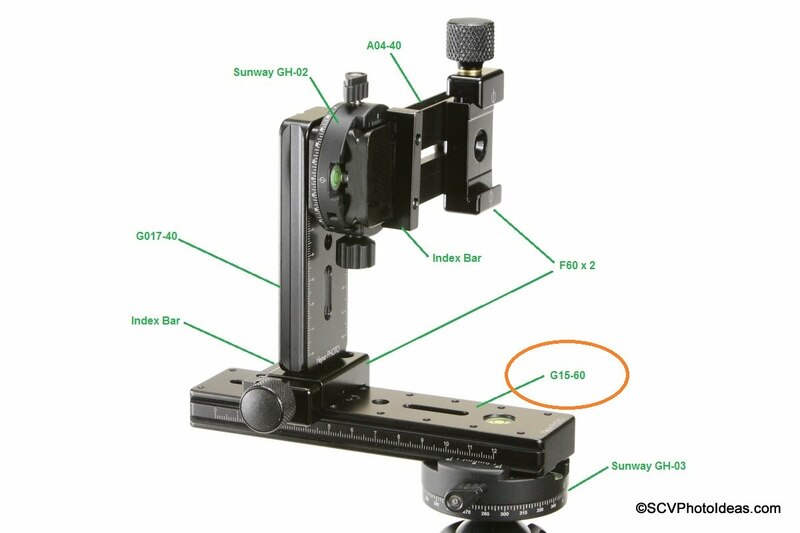 SCV Mini MR Panorama Head Overview and Parts. Current price for the G013-60 Multipurpose Rail is US$ 45.00 (+Shipping where applicable) and is available from the Hejnar PHOTO on-line Store. 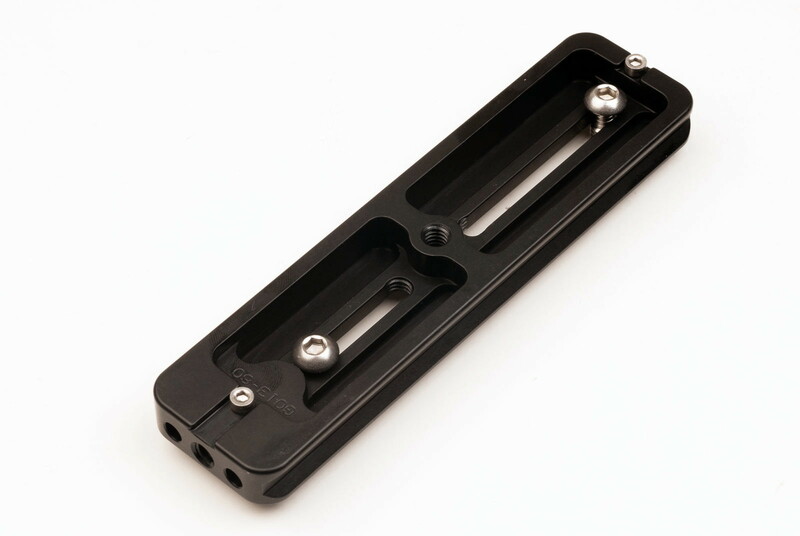 Those wishing to get the Mini MR Panorama Rail package with a 6" (G013-60) horizontal rail in place of the 6" 5/8" thick and heavier (G015-60) may contact Hejnar Photo for an arrangement with no extra cost.